Woody’s can count many very good lure fishermen amongst their customers. They recognize that lure fishing is a method that allows the angler to cover much more water, so enabling them a better opportunity to find that feeding fish. 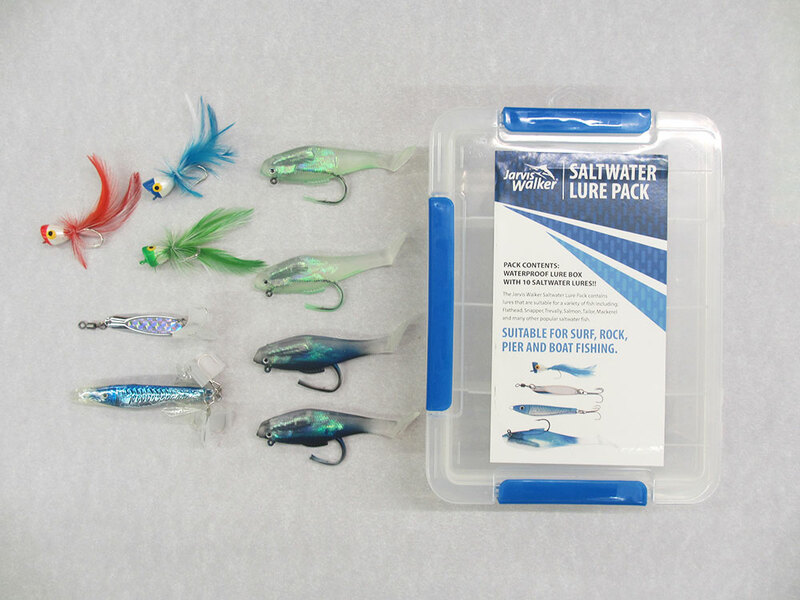 Many of our customers are using this knowledge when sea fishing and so Woody’s have listed below a selection of images of some of the saltwater lures we keep in stock. It is a great way of targeting fish with the added bonus that a fighting fish does not have to tow the added burden of a one hundred gram plus weight! Nearly all saltwater fish around the world eat squid. 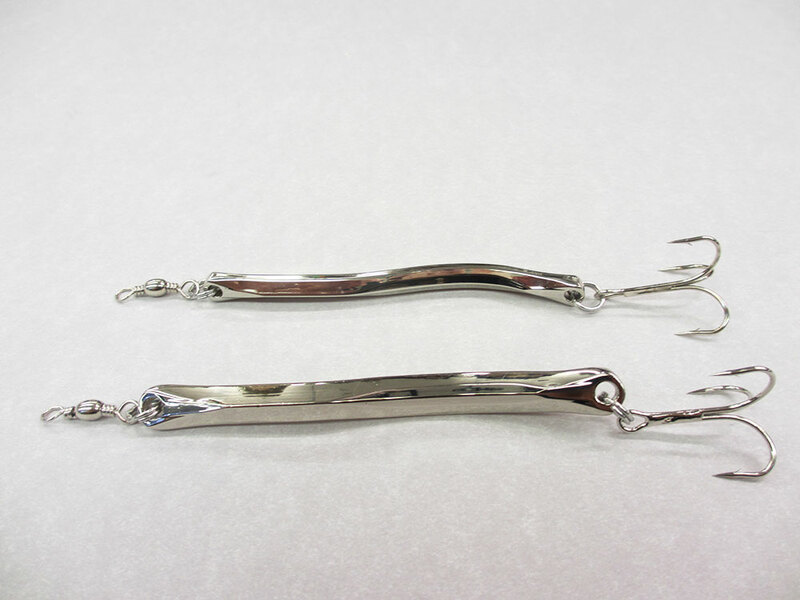 Actually we do have some of our pike angling customers buying these for use in freshwater. 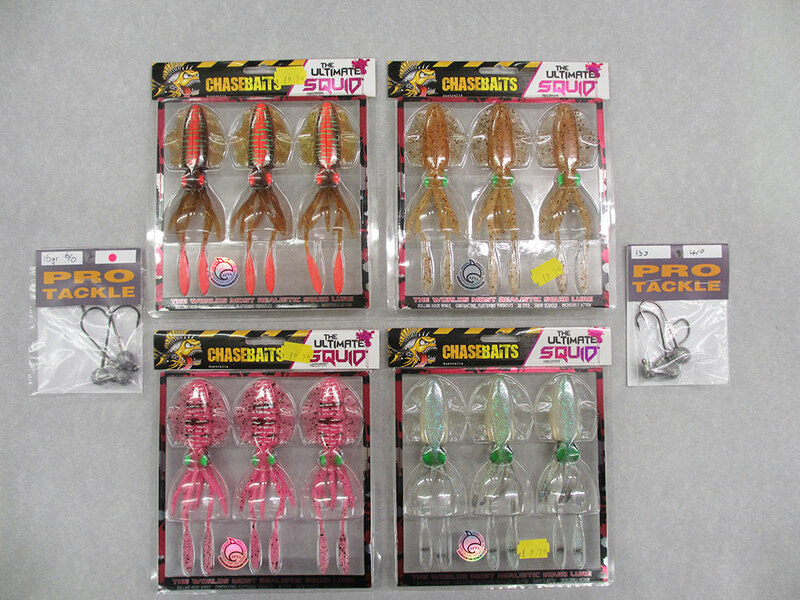 Chasebaits advertise these as the ultimate Squid and it is easy to see why. To quote Chasebaites – “The wings will mesmerise you with the most realistic roll and swim action just like a real squid. 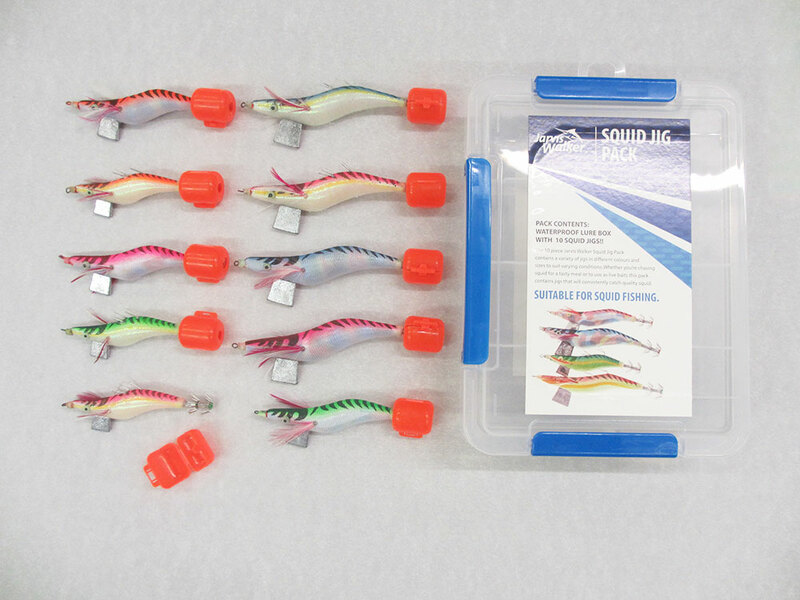 With custom 3D eyes, contracting tentacles and extended candles that flutter with any movement, the squid is one of the most adaptable and realistic squid lures ever made”. Just rig with the size of leaded jig hook that suits your fishing. 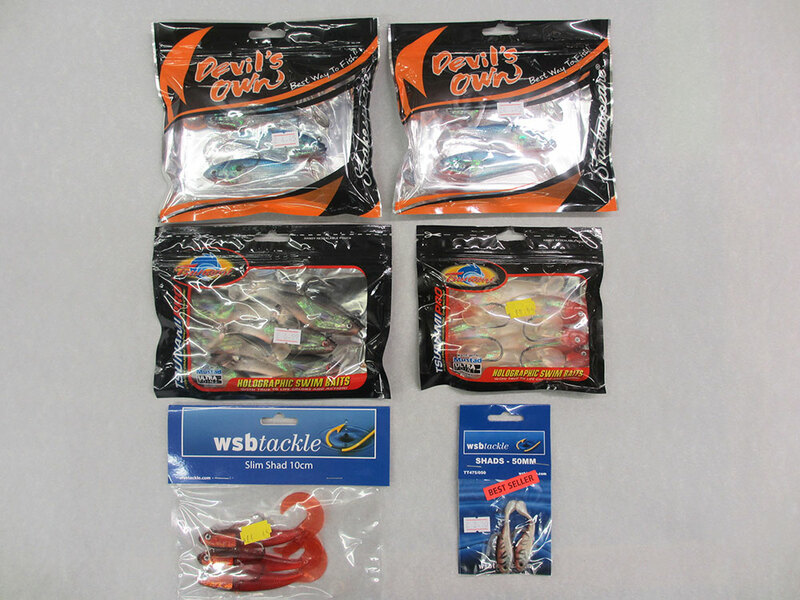 Pack of three baits £8.29 inc vat. 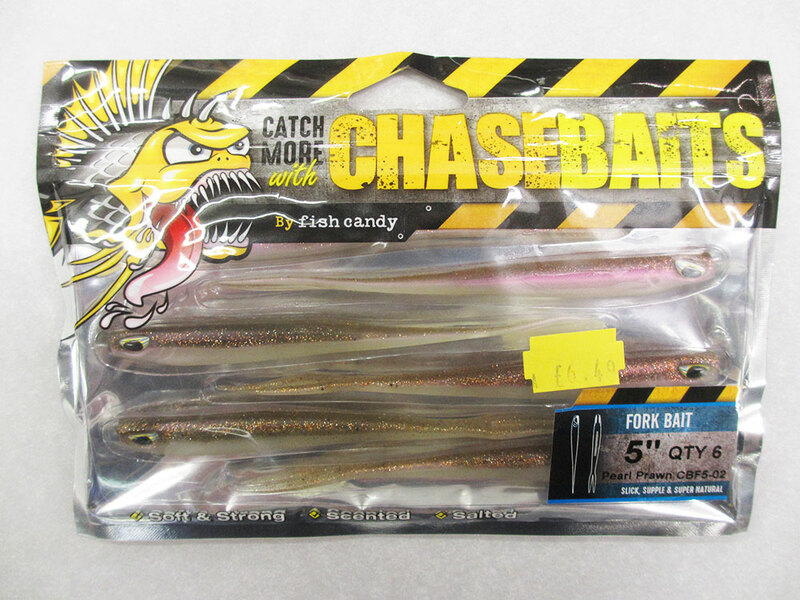 These Chasebaits “Fork Bait” can be used in either fresh or salt water. Streamline, soft and supple it allows the bait to swim straight, although when twitching the rod the lure comes alive. It can bend back on itself and whip the tail in all directions. It looks just like a wounded fish that is swimming for survival. 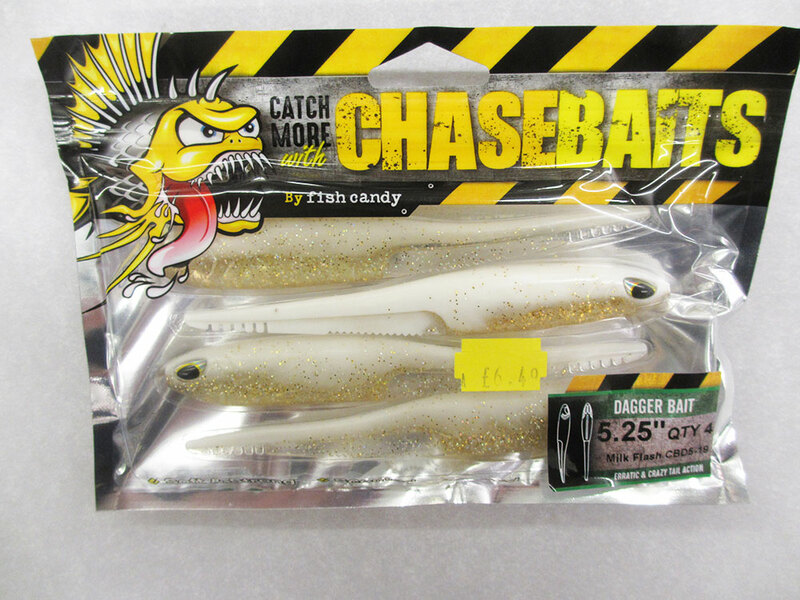 These Chasebaits “Dagger Tails” have a sleek body and thin tail sections designed to whip and cut through the water. The end result is a lure that is sleek, fast and very erratic, just like a panicking fish. 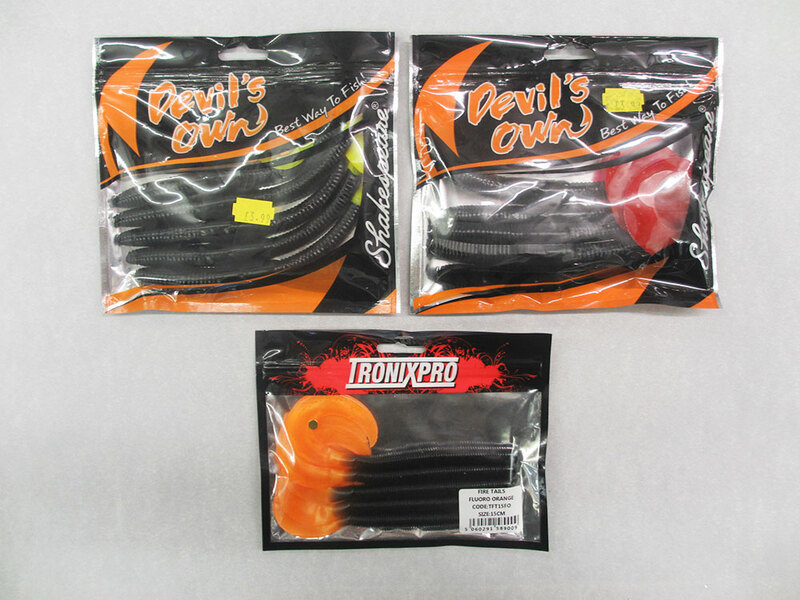 Featuring the same thin and deep wall ribs as the “Paddle Tails” these “Curly Tail” baits are perfect for when a slower retrieve is required. 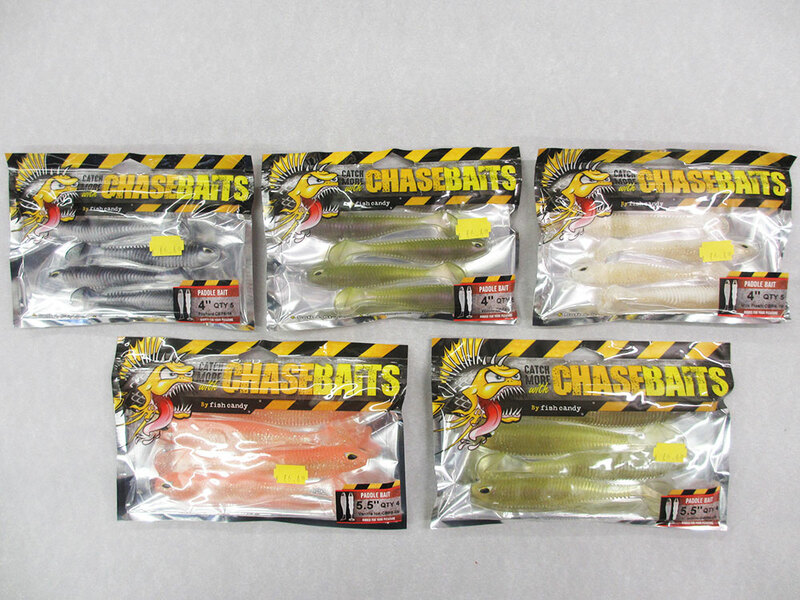 These Chasebaits “Paddle Tails” can be used for either fresh or saltwater fishing. 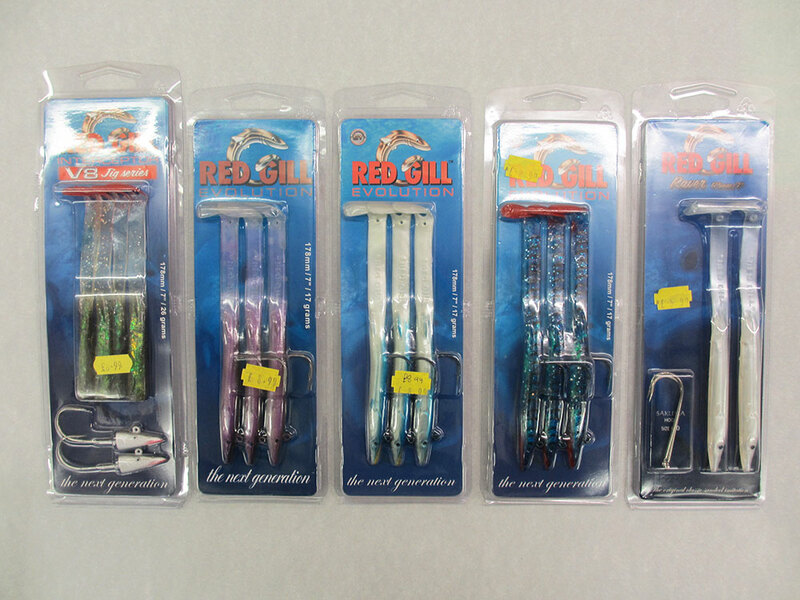 These lures have thin wall ribs which are incorporated to give a unique “Body Wave” design to feel softer and more natural. The deep ribs will hold scent and give off vibrations to attract fish and will also hold air when cast which they release like a dying fish. Those customer with good eyesight will notice that they have printed on the packet “Ribbed for your Pleasure” so satisfaction should be guaranteed. 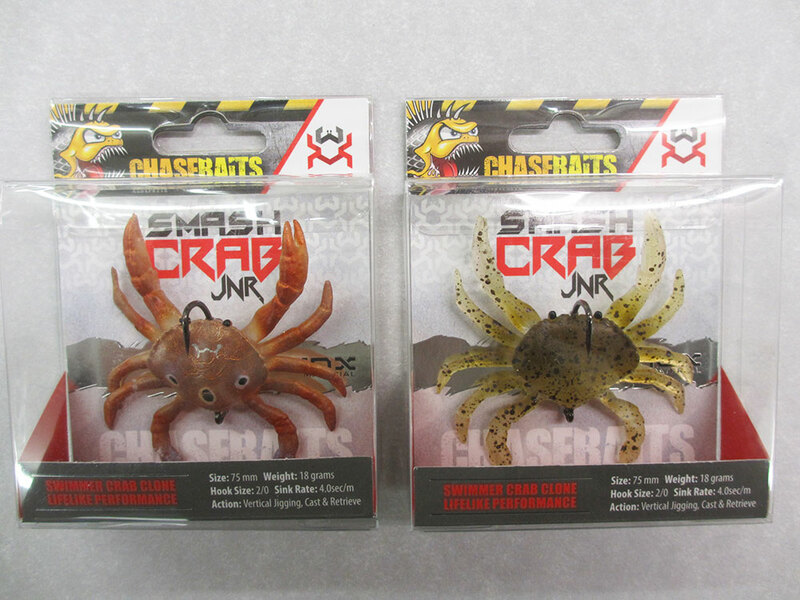 Every salt water angler knows just how difficult it is at times to find crab bait. 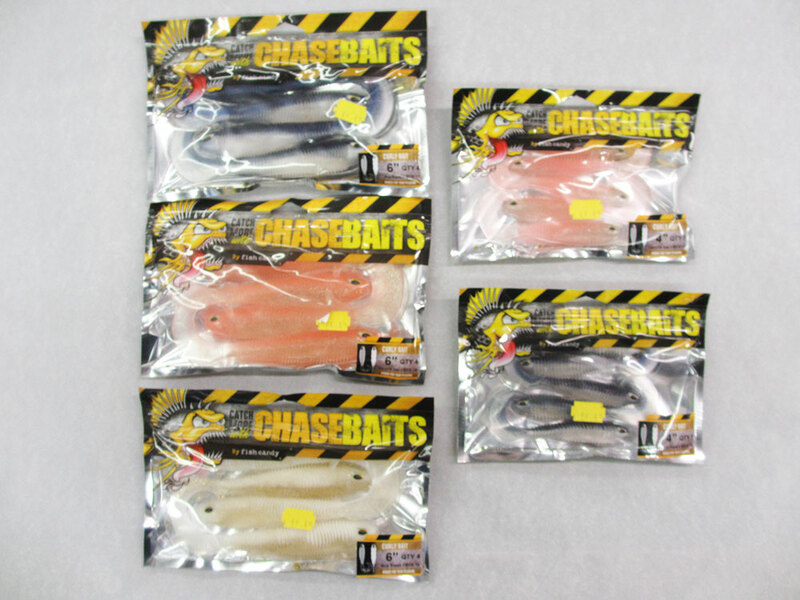 In truth, frozen bait does not give much movement so why not use these “Chasebaits” instead? 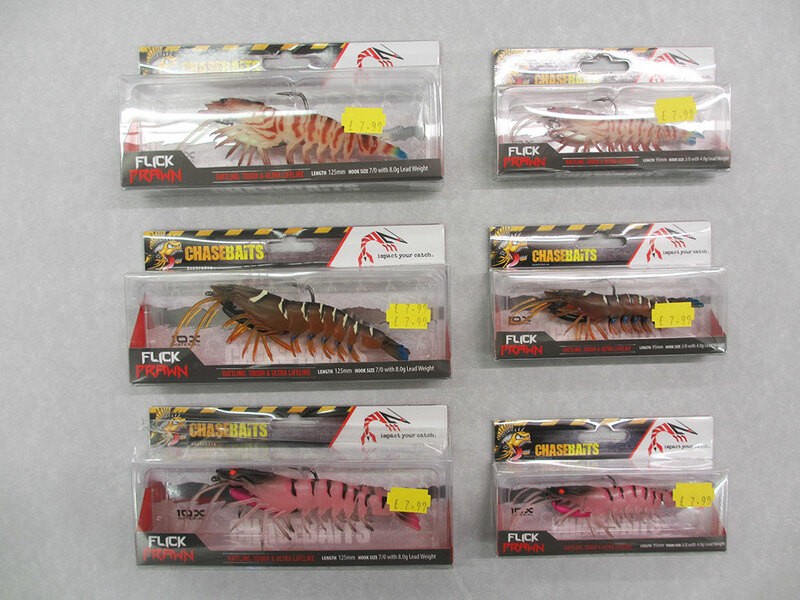 They are of course very cost effective and the angler always has the use of fishing a crab when a change is needed. Woody’s recommend applying pilchard oil to the bait. This will produce an irresistible scent trail in the water. 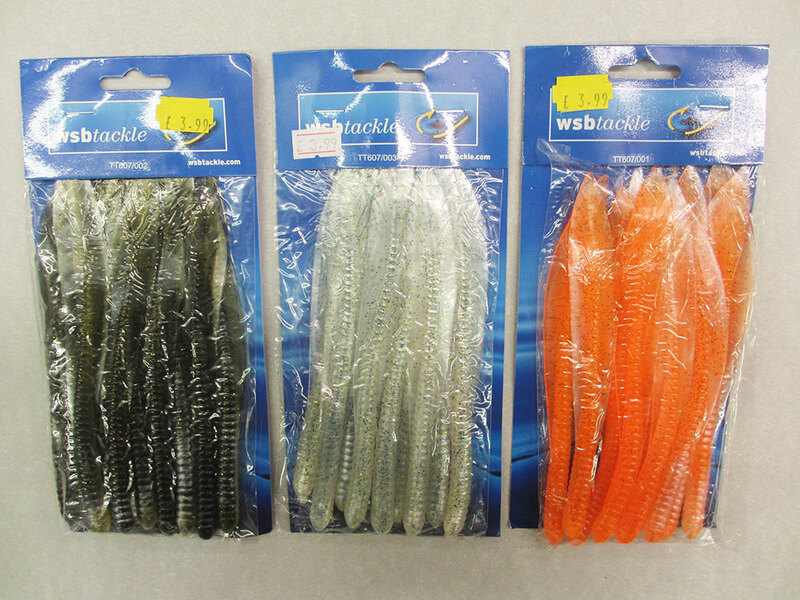 Available in four colours – size 95mm, weight 18grms, hook size 2/0 and 100mm, weight 39 grms, hook size 4/0. 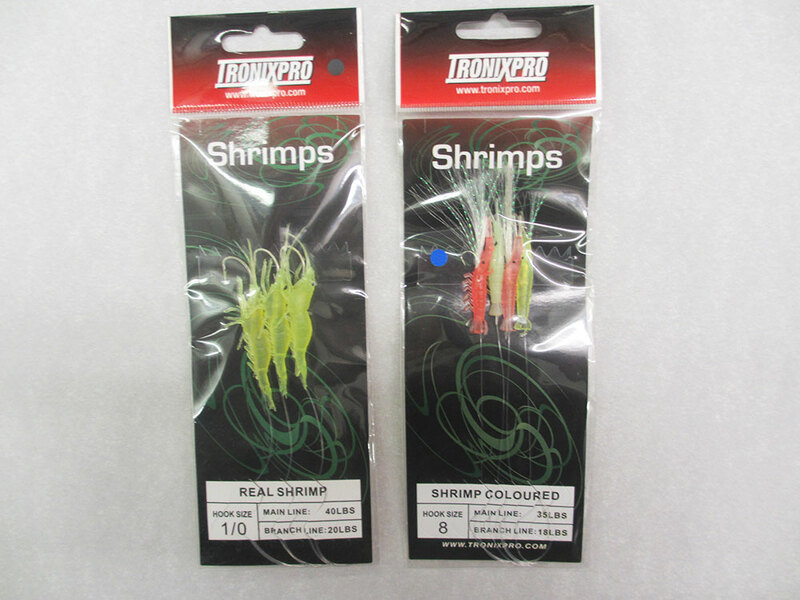 These “Chasebaits” soft prawns are the best imitation that we ourselves have ever seen. Just shake the box and marvel at how everything vibrates and moves. Nearly all fish like prawns – including us! Woody’s keep three colours in stock in two sizes. A 95mm size weighing 8 grm with a 3/0 hook and a 125mm size weighing 18grm with a 7/0 hook. If long casts are required to reach fish then a barrel or bullet lead can be positioned one metre from the lure. Just fish with a bobbing slow retrieve and wait for the action. 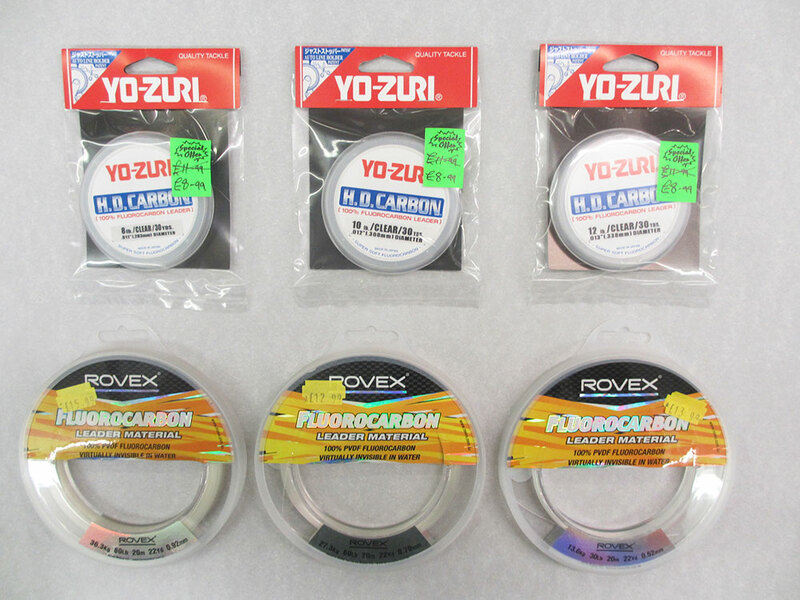 Woody’s would recommend the use of a fluorocarbon line trace to maximise success or possibly our superfine wire traces where needed. These “Cebar” lures or “German Spratts” have accounted for thousands of fish during the last fifty years. Their chromed slim design imitates sand eels in the U.K. and needle and pin fish in other parts of the world. 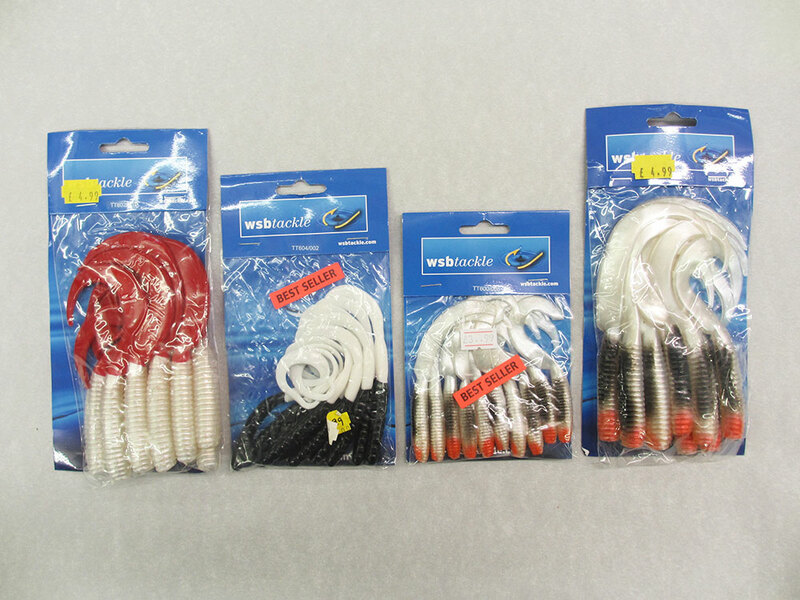 They are very durable and cannot be damaged from numerous strikes by barracuda. (Not many of those around the shores of the U.K.). 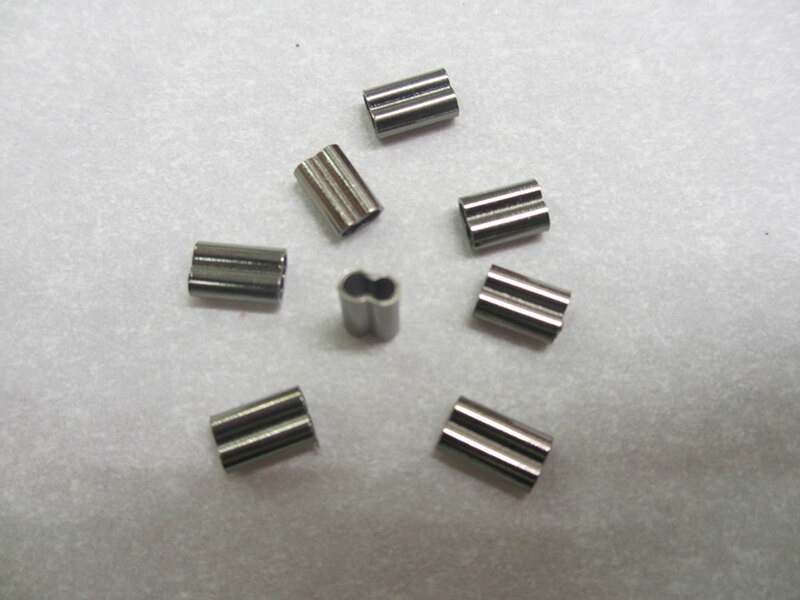 They are available in 38grm and 48grm weights. 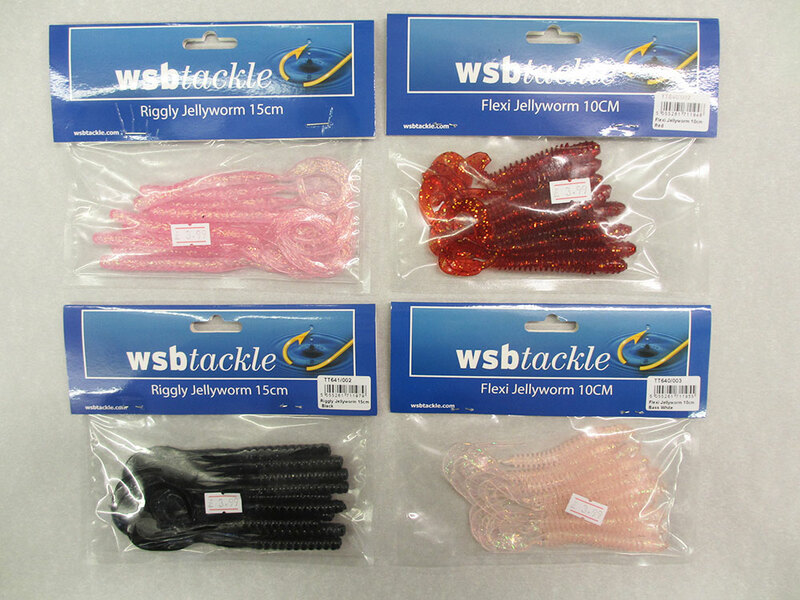 Apart from the fact that a lot of squid have recently been caught along our south coast, Woody’s see customers from various parts of the world seeking to purchase squid jigs. Woody’s have a great selection including luminous and “heavyweight” patterns. 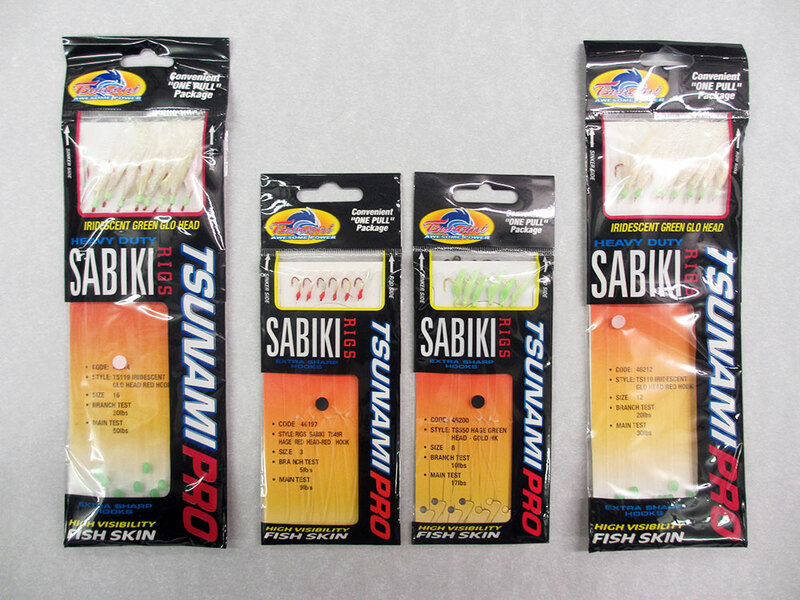 We have a large selection of Mackerell Lures including the Sabiki and Tronix lures. These “gel worm” lures are best fished using a sink and draw technique. Use a barrel lead threaded on the mainline for extra weight. The weight is then “stopped” by a swivel. Next tye a metre of fluorocarbon to the swivel and then a leaded hook on to which is threaded the coloured worm of your choice. Absolutely deadly for most fish. 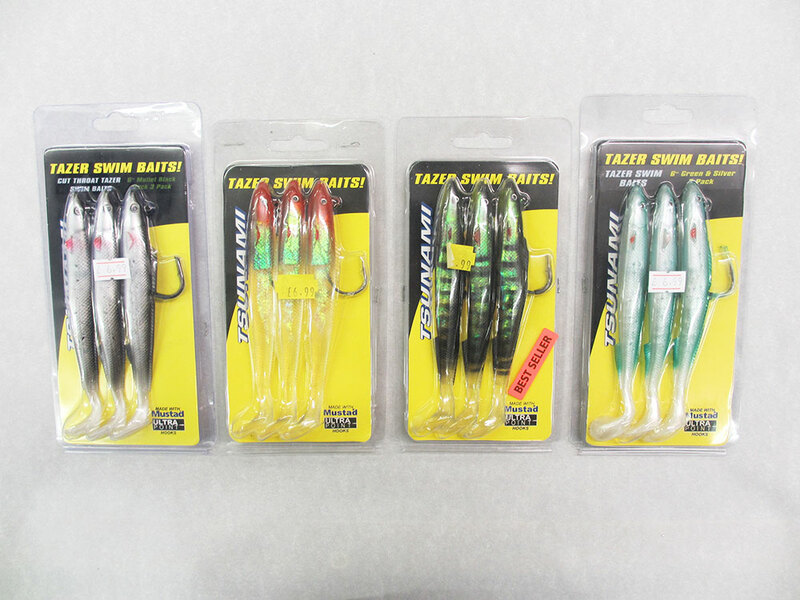 These “Shad” baits are also best fished on the “sink and draw” principle. Add extra weight, if needed above the fluorocarbon trace etc. John has caught Tarpon to 25 kg in Cuba so it is a technique that works for many species of fish. 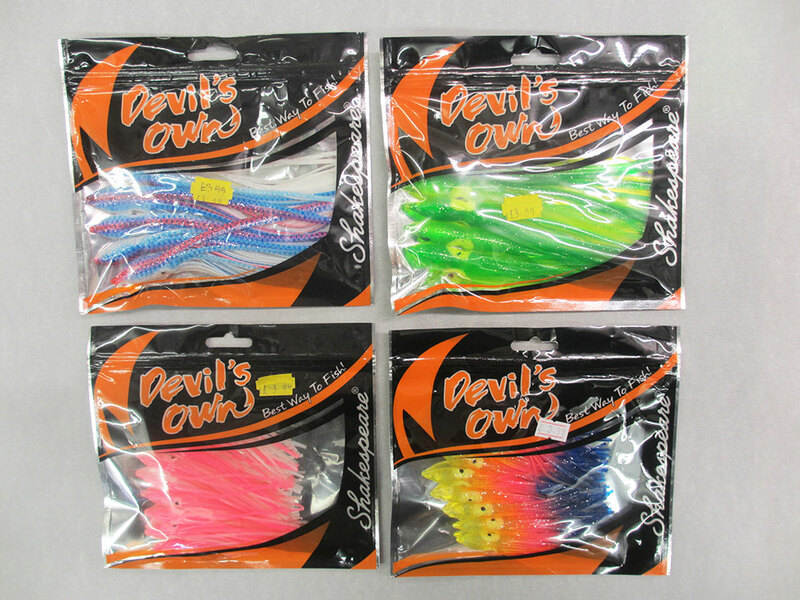 These artificial squid or “muppets” as they are sometimes called offer a good alternative on those days when fishing the worm is slow. 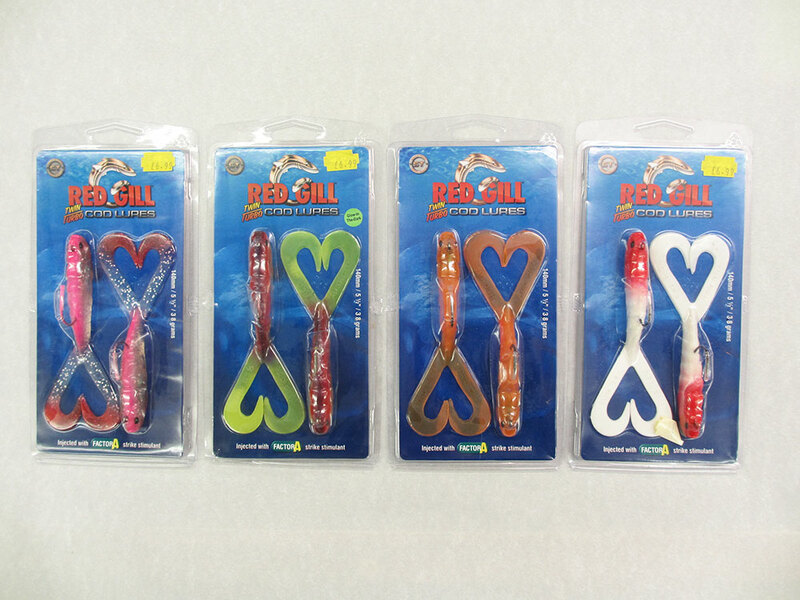 They can be fished singly or by tying up a string of three or four when boat fishing and then using a Pirk as weight. We ourselves have fished these eels successfully for forty years. 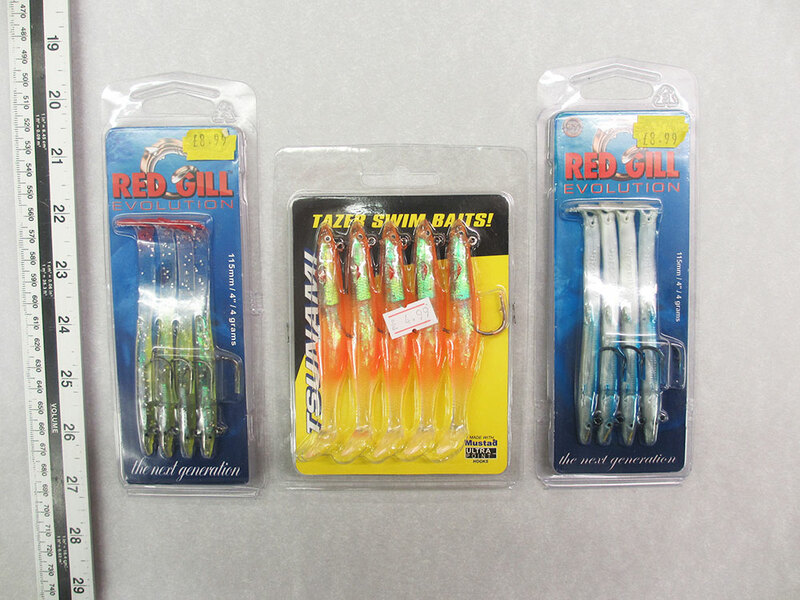 They are particularly good for Pollack Ling, Bass and Cod. If boat fishing then they are best fished on a three metre trace using a “French Boom”. Woody’s will advise the correct method of rigging when you visit the shop. 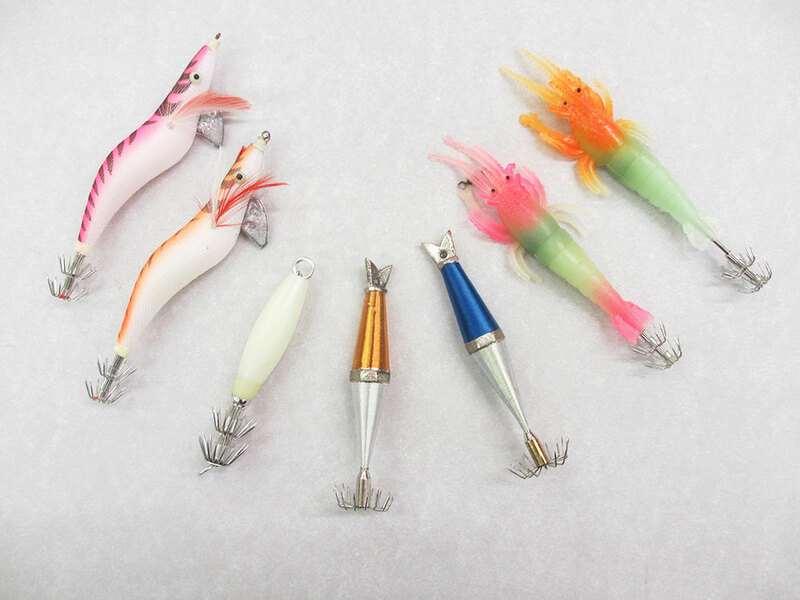 These Eddystone “cod” lures are not just for cod. They do in fact work very well for Pollack, Ling and of course, Bass. From the pier or beach they are best fished on the sink and draw principle or from a boat, jigging brings the best results. The use of Fluorocarbon line when making up traces can sometimes offer a big advantage to the fisherman, as fish find it so much more difficult to see. Woody’s keep in stock a variety of sizes from 2.7kg up to 36.3kg. Please remember that double crimps are best used on the heavier sizes as the larger diameter line is difficult to knot. They are an improvement as they offer a neater and stronger attachment. Woody’s will advise. 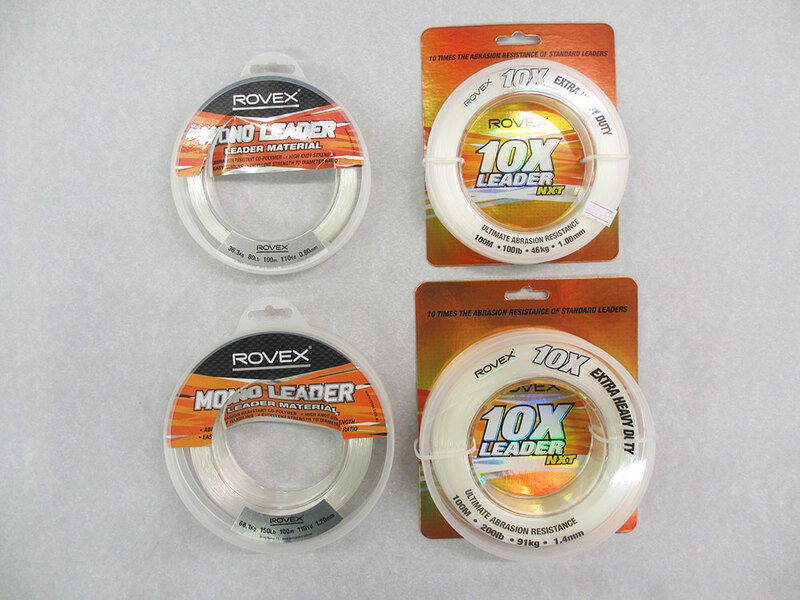 Many of our customers now use strong monofilament instead of wire for some species of fish. The advantages are obvious as is is not so visible to the fish. Woody’s keep a comprehensive range of monofilament, ranging in sizes from 30kg to 68kg. Woody’s recommend purchasing the correct size of double crimps when securing the stronger lines to hooks or swivels etc. as the thicker lines are difficult to knot in a neat and secure fashion. Economy crimping pliers are available in store. 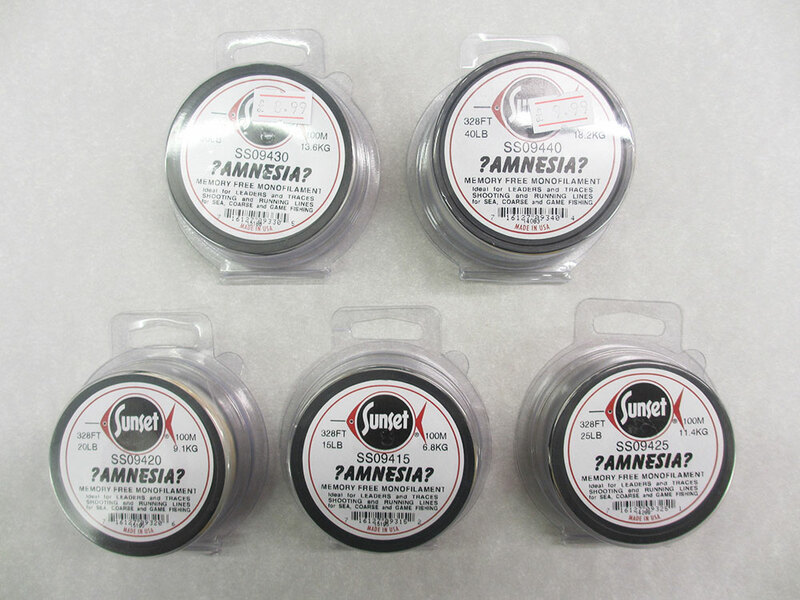 Some of our sea fishing customer like to use “Amnesia” monofilament for traces when fishing on the bottom of the sea as its “memory free” properties allow for better bait presentation. Woody’s keep a variety of sizes ranging from 6.8kg – 18.2 kg. Woody’s keep a good selection of double crimps suitable for crimping most sizes of trace. Economy priced crimping pliers available in store. 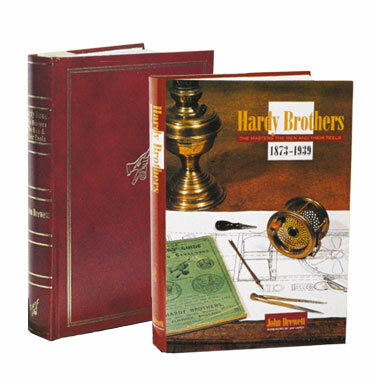 Six hundred pages printed in top quality colour, 150,000 words and 800 pictures make this the most comprehensive and accurate collectors book available on the world’s most illustrious Fishing Tackle Maker. Visit www.hardybook.com for more details.